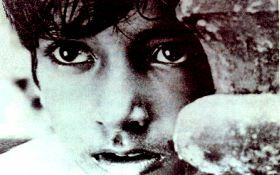 This first film from cinematic maestro Satyajit Ray is getting a reissue to mark 10 years since his death in April 1992. It is quite simply a movie masterpiece; run, don't walk, to any arthouse cinema that shows it! In a remote corner of Bengal, a poor family struggles to make sense of the society they live in. Hari (Kanu Bannerjee) is a priest who wants to be a writer, but isn't quite making enough money to support his wife (Karuna Bannerjee), young daughter Durga (Runki Bannerjee), infant son Apu and cranky old Aunt Indir (Chunibala Devi). Flash forward about five years and Hari is heading off to find work, leaving his wife to look after the increasingly feisty Indir, the mischievous Durga (now played by Uma Das Gupta) and the curious Apu (Subir Bannerjee). It's astonishing to think that this is Ray's first film; it is so directorially accomplished that it blows today's filmmakers right off the screen with its subtlety, insight and sheer inventiveness. Ray once admitted that his film school consisted of watching the work of DeSica, Fellini, Ford and Welles, and all of those influences show here, but with a remarkable eye for the place and time of this particular story and these characters (brilliantly performed by non-actors). This is an honest and earthy look at life with energy, humour and, yes, tragedy. And Ray captures the details so beautifully that it takes our breath away; memorable people and images fill the screen as he examines universal themes about trying to make sense of what happens to us, both happy and sad ... about juggling responsibilities, tradition, opportunities and progress. The film absolutely throbs with humanity and meaning. It's a definitive must-see movie, and I can't believe I waited this long to discover it.